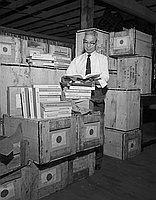 Man examines crates of books, "Minami Kashu Nihonjinshi" or History of Japanese in Southern California, in what appears to be a warehouse, California, ca. 1950-1964. 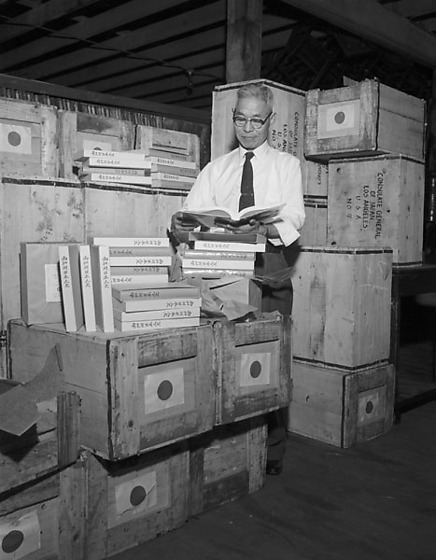 Dressed in eyeglasses, shirt and necktie, the white-haired man Japanese man looks at an open book amidst stacks of books piled on crates with the flag of Japan and addressed to the "Consulate General of Japan, Los Angeles, USA". Typed on original envelope: Book of Southern California Japanese History.